Ashley Horton Designs: Traveler's Notebook FREEBIE! Happy Weekend everyone! I have currently become obsessed with the idea of Traveler's Notebooks. Call me crazy...because I don't even have my stuff yet...but I am super excited about working in a TN! I'm so excited, that I even decided to make some FREE Printables to share with you! 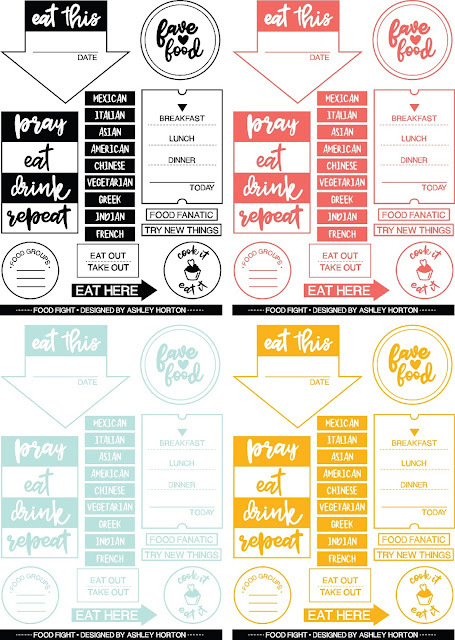 This first set of Printables is a foodie themed set. I LOVE taking photos of my food, so I thought this would be a perfect first set. I don't always feel like creating a full 12x12 layout with a photo of my food, but I think the TN will be a great way to document the food photos I snap to share on Instagram. So here's the deal! Click on the Food Fight graphic below for the FREE Download. The files are saved as a PNG image. And I even have four different color selections for this design. You can use this Printable set in your Traveler's Notebook, Planner, PL spreads, Layouts, Cards and even digitally! I hope you enjoy it! If you're using any of the designs in your projects, I would love for you to tag me if you're posting on Instagram @ashleyhorton75. Let me know if there are any suggestions you have for Printable sets, and I'll see if I can accommodate! So nice of you to share these, Ashley! Love them!